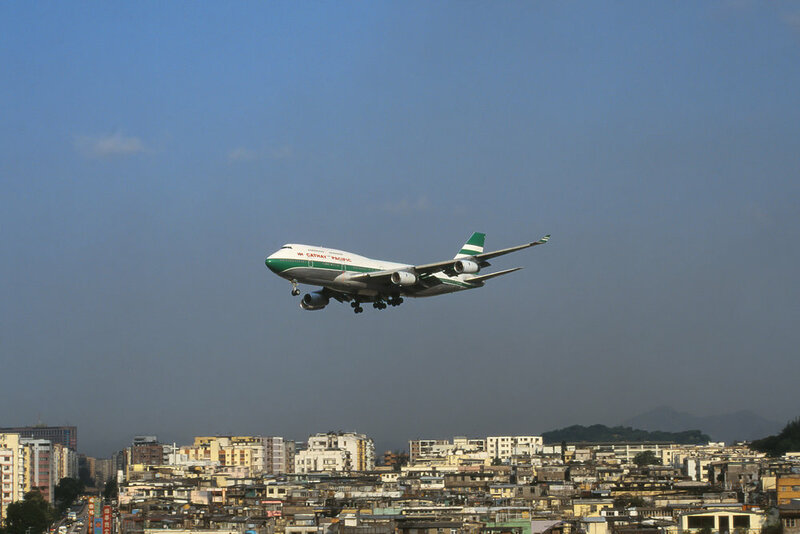 Much loved by aviation enthusiasts and photographers the world over, Hong Kongs Kai Tak airport first opened in 1925, and through continued development and expansion, served the city and the island until it ceased operations in July 1998. Over-crowding and continually increasing demand, combined with ever greater safety concerns, saw a new state-of-the-art airport open at Chep Lap Kok on the very same day that Kai Tak switched off its approach lights for the last time. Up until its closure, Kai Tak provided a unique and spectacular location for airplane photography. The sight of large heavy jets only a couple of hundred feet above the tightly packed tower blocks of Kowloon making that final 45 degree turn to land on Kai Taks runway 13 was like nowhere else on earth. To the informed observer, very few approaches at Kai Tak looked quite the same. The final turn to line up was around 500 feet AGL but depending how accurately it was flown, the actual height and and bank angle required to do so varied considerably. The local carriers got more practice and certainly seemed to have it all down to a fine art and they were usually rolled out wings level well before the folks from out of town managed it. The foreign airline crews for whom it was not such a regular destination found it more of a challenge. The resulting turns on to final displayed a wide range in both altitude and bank angle. This was compounded by the requirement by many carriers for a mandatory missed approach if the airplane went north of the centreline on the final turn. Breath-taking images resulted from vantage points both on the main terminal multi-storey car park or from the many tower blocks to the south of the final approach. A day spent 8 floors up on a shaded stairwell reaped its rewards - the late afternoon sun in particular picked out the high-rise skyline as a unique backdrop to the 747s in a sharp turn as they banked hard right for a visual final to runway 13. An archive approach plate for the IGS approach to runway 13 at Kai Tak shows the unique requirements for landing at Kai Tak. The procedure involved an off set ILS approach towards "checkerboard hill" (literally a huge red and white checked board painted on the side of a big rock face) until reaching the middle marker, at which point the runway must have been acquired visually for the approach to continue. From here it was a case of a 47 degree right hand turn to line up on the runway heading of 135 degrees at 500 feet AGL in a stabilised configuration. Failure to meet the stabilised criteria or any deviation north of the runway centreline was a mandated missed approach in most operators SOPs due to obstacle hazards and terrain clearance. Having made the final turn earlier and flatter compared to most overseas carriers, a Cathay Pacific Boeing 747-300 is established on final of runway 13 just inside "checkerboard hill"
From a vantage point located on a tower block 8th floor stairwell to the southeast of the centreline, this example of a Korean Air Boeing 747-400 was typical of the first view you would get of the arriving traffic as it made the visual turn from the IGS to the final approach heading for runway 13. The sequence below illustrates the view of the runway 13 arrivals from the terminal multi-storey car park. This spot was good for the early to mid morning traffic. 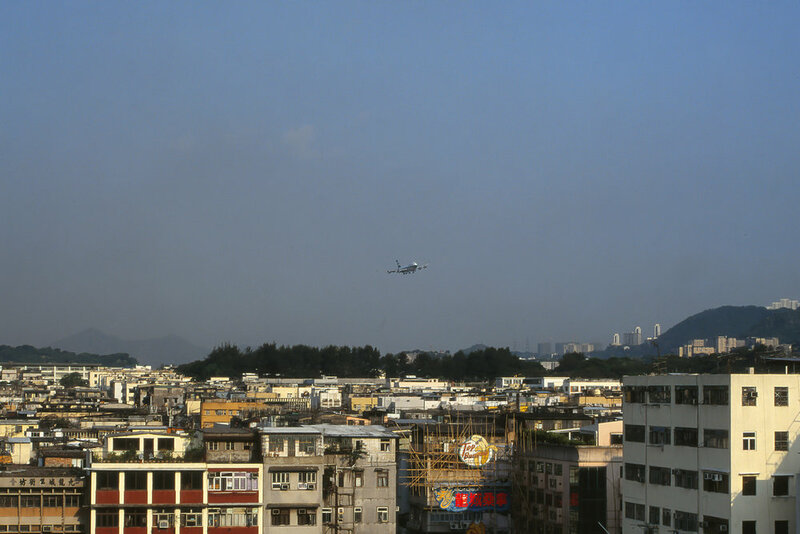 The tower blocks offered a panoramic view of the Kai Tak main parking apron. Locally based airline Cathay Pacific dominated the movements but many regional Asian airlines and long haul carriers from all over the world combined to produce a wide and colourful array of operators and airplane types. My visit to Hong Kong was 13 months before Kai Tak closed and I was very glad I managed to see it before that spectacle was gone forever. Few places now exist which present such a unique environment and an unmistakable vista - Kai Tak was one of the best places in the world for airplane photography and those memories will last a lifetime. I spent 5 days there and shot 24 rolls of Fuji Sensia. The best of those 850 plus photos are what you can see in the Kai Tak gallery by clicking on the image below.